You hand a child a cookie, and wait for the magic words. Why do parents do this? Are we strict? Legalistic? On a power trip? Or maybe we just hope the child refuses, and then we can eat the cookie. Well, maybe. But maybe we’re interested in instilling the virtue of gratitude into our children. Part of that is a tad selfish. Ungrateful children are demanding and difficult to live with. They stomp around, never satisfied, expecting the world to give them what they think they want. It was Shakespeare who penned “How sharper than a serpent's tooth it is to have a thankless child!” So unless we want to become perpetual slaves to our children, we need to teach them not to take for granted what they have, and to show appreciation for what they receive. And now there are more reasons than ever before to teach them (and ourselves if we’ve missed or forgotten the lesson) gratitude and thankfulness. Apparently it’s a key factor in determining happiness. So what do we have to be thankful for? Probably more than we think. Richard Wiseman, in his book 59 Seconds: Thinks a Little, Change a Lot, suggests that we lose sight of those aspects of our lives that should bring us happiness. He likens it to walking into a room where bread is baking in the oven. The pleasant aroma is unmistakable. (If bread is not your thing, consider cinnamon rolls, pizza, a turkey dinner, or chocolate chip cookies. Yum.) But the longer we remain in the room, the less we’re aware of the smell. We become accustomed to it, and our brain no longer notices it. In order to smell it again, we have to leave the room for a period of time, and reenter. Of course, the importance of thankfulness doesn’t take God by surprise. Nor does the importance of chronicling our blessings. Psalm 136 is just such a journal. While we're thinking about gratitude, Veteran's Day is also a good day to thank a veteran for his sacrifice that has helped preserve our freedom. I have so much to be thankful for. It's funny, I always take time to be thankful for big things, but some times I forget to be thankful for the little things until an hour or day or two after the fact. I'm not sure why that is, but it's something I'm working on. I was thinking just this morning (Thursday morning) that it would be so awesome if we could all show the same level of gratitude - to God (and to each other) for big and little things - that my little cat shows me every time I feed her. Great post, and I ditto the thanks to all the veterans - my dad, brother, and brother-in-law included - oh, and Anita Mae, too! I think you're right about the little things. I am truly thankful for my first cup of morning coffee at the moment. Perhaps the key to finding those little things that we forget to give thanks for, is recognizing what we really would miss if it were taken away. 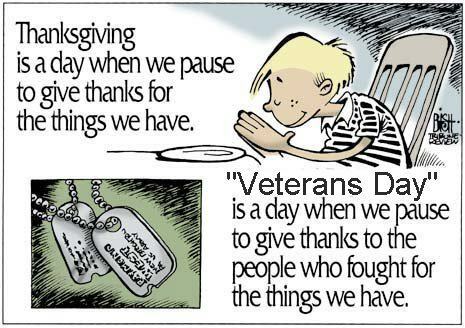 And yes, we need to thank all our veterans. I can thank my dad and uncle, and remember my grandfather. And the "thanks" is important. My dad came home from Vietnam during a period when thanking veterans was not the norm--spitting on them was. I think the rude homecoming did more damage to him than any of the things he saw during the conflict. I'm thankful for my husband who dodged bullets and landmines to return to the girls and I. If he hadn't been able to return, our boys would never have been born. I still have Nelson's letters sent while overseas. They're filled with enough horrible details to keep a writer's imagination busy for ten lifetimes. And they're also filled with love and longing for the girls and I. I'm so thankful he's safe with us. And I'm thankful for all veterans for putting themselves in the line of danger so we can have freedom in our social, physical and spiritual lives. I posted Pastor Lorne's Sunday's message to the church blog last night. Part of it reads, "We celebrate Remembrance Day because we have freedom. Because no one is going to come and break down the door and stop us from worshipping. We can revel in the Lord without worry." 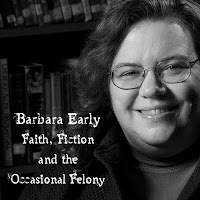 It a really good post, Barb. Tks. Rejoicing with you for Nelson's safe return. We've had religious freedom for so long, it's one of those things that we take for granted. But historically, and even in other parts of our world today, it's a rare thing. I'm very, VERY thankful for those who devote their lives to keeping us safe and free. It's a hard job, and I appreciate them being willing to do it. Many people think of Canadians only as Peace Keepers because that's our role in NATO and the UN, however, I'd like to send out a thank you those 150 families who've lost loved ones since Canada started sending troops to Afghanistan on Peace Keeping duties. As a Peace Keeper, our troops aren't allowed to fire until they are fired upon. And sometimes that's just too late. Anita, I had know idea. It never occurred to me that Peacekeepers didn't play the same role as soldiers. I'm in awe of their bravery and sacrifice. Outrageously blessed. I like that. Sounds like a good title for an inspirational book on gratitude. I love the Melody Beattie quote, and oh boy is it enjoyable to be around people who are thankful. It transforms us into Joy Full, as well. And of course being around ungrateful people. GRRRRR. This has been a super day on Facebook. Don't you love seeing all the shout-outs and photos for our loved ones who have served the nation? I'm grateful today especially for the support of writer friends. Who ya gonna call? And the fact it's Friday! I'm blessed in a million ways. I want to be thankful in all circumstances and God is working on that. Deb, what a great way to wrap up the day. That joy is contagious.